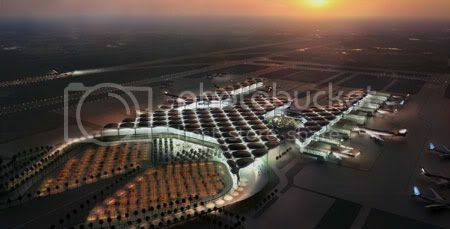 The concept for the Queen Alia International Airport articulates a sense of Arabic hospitality, combines function, technology and a distinct sense of place to provide a greatly expanded and enhanced gateway to the region. Queen Alia International Airport, named after Queen Alia, the third wife of King Hussein of Jordan who died in a helicopter crash in 1977 is Jordan's largest airport that is situated in Zizya area, 20 miles south of Amman. The airport has two passenger terminals and a cargo terminal that was built in 1983. The new expansion of the airport is designed by Foster + Partners, to make Jordan a regional hub and once it is completed, it should be able to handle around nine million passengers a year, nearly three times as many as it does now. Retaining the existing runway, the scheme comprises a new terminal building that will bring a sense of clarity to the airport, streamlining circulation and establishing coherent wayfinding. Formally, the building draws on the vernacular tradition of outdoor areas and open-air gardens. These courtyards contain water pools that reflect natural light into the building and provide a comfortable microclimate, as well as a subtle means of establishing orientation inside. Large covered interior spaces form a direct relationship to the external environment and accommodate generous greeting and hospitality areas that are central to the terminal’s cultural programme. 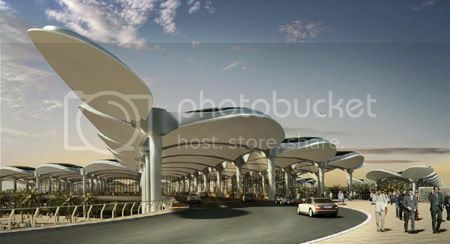 An environmentally sustainable system, the airport's canopy roof has been inspired by the organic form of natural palm trees, while its black external surface is reminiscent of Bedouin tents. Split beams at the column junctions and generous reveals allow daylight to flood deep into the building, creating a dynamic play of light while also offering shelter from direct sunlight. The roof canopy acts as a thermal store to heat and cool the building and also conserves water by collecting rainwater and night time condensation. In addition, banks of photovoltaic panels have the potential to supplement the electricity supply, so reducing the building’s energy consumption.